My hard on for good New American is an obvious dead giveaway - when in North America - I always want the best of the New American-cuisine. I think it's because of the whole package… you know what you're supposed to be getting in to. Familiar dishes, with a gourmand-twist… the use of local, seasonal, real ingredients; typically (hopefully) sleek modernity paired with a rustic-comfort and sensibility in the decor and presentation of menus, fonts, and interior. Unpretentious is a must at these places. I am not into the snotty high-end ultra-lounge-looking "New American" places that give New American a bad name. These places usually have simple names too… and it's usually the initial cat call that sends me checking out the restaurants reviews like I'm checkin' out a chick. I made a funny observation today (in Sydney, Australia on Sound Wave Festival) to my guys… I caught myself cruising a restaurant like I was about to pick it up. So yeah… I have a food problem. We were in the midst of yet another day off set out in the outskirts of Boise - it took a bit of research… but we found Fork. We grabbed a cab and headed into the city. I've since been back here again on a more recent tour - but my first date with Fork went fantastically. Like I mentioned before with 38 Central, there are a couple elements within Fork that they need to add to work with the city and the clientele of the locals - things that sort of throw the true New American thing for a loop - but nevertheless - food is more important than any of that hullabaloo. I am not into Vodka cocktails. Vodka cocktails typically are something you find in an "Ultra Lounge" or a "Vip Bar"… it's (typically) a club-er-alcohol when an ingredient in a cocktail (I am up for being proven wrong on this if someone can show me a classic or modern cocktail that uses Vodka well). Fork: Gin. The way it needs to be for a good cocktail. We start with Z's Bucket (Bardenay dry gin muddled with fresh berries, basil, lemon juice and soda spirits) and the Cucumber Cooler (Hendrick's gin (best damn gin I know of), St. Germaine (a new love of mine in a cocktail) Elderflower, muddled cucumber, hand squeezed fresh lime, and fresh cracked pepper. Both were refreshing, a hint floral - and pretty darn good cocktails. Looking at the Cooler, it reminds me quite a bit of a few classic cocktails - The Aviation, one of my old favorites - seems to possibly be a root-ancestor of the drink. The use of cucumber and pepper was definitely an interesting, but complimentary idea. The Grilled Jumbo Artichoke is something I noticed on a lot of tables at Fork, so I had to have it: Garlic basted jumbo artichoke, fire kissed and served with sauce remoulade. The heart eats like a normal artichoke heart, but you have to get a method and flow going with biting down on the leaf and pulling the "meat" away - I found it fun. A simple dish, a great dish - I don't think I'd had jumbo artichoke before - the remoulade was similar to an aioli - the starter really concentrated on the flavors of the artichoke - not too much mudding it up. Idaho - Potatoes are a must. The House Chips were hand-cut Idaho russets, chile-lime salted and served with Fork sauce. Greasy, crispy, salty, yummy chips. It's like all the joy you'd get from childhood of tearing into a bag of chips… only you know with these it's quality ingredients, it's house-made, and it's damn good. (Maybe not good for you… but certainly healthier than the factory-made imitators to house-made). The Greenbelt salad was field greens, shredded Ballard Farms cheddar, red onion, dried sweet corn and ginger vinaigrette. The corn niblets were crunchy - replacing what could have been croutons - a pretty awesome thing. The vinaigrette was the proper amount of acidic and citrus-tasting. I had seen on tables when walking in, this bowl of what reminded me of those Pik-nik (or whatever they are called) shoestring-fry-type-things from childhood. It looked sort of like a massive soup with fries or maybe moules frites - little did I know that it was to be my main: Local Ale-Braised Short Ribs (fork tender Northwest beef, garlic honey mustard sauce and smashed potatoes. The short ribs were hour-long pot-roast-style tender - juicy and easily chopped with a spoon; the shoestring-fries were crispy and fantastically a touch-greasy - when they made contact with the meat or sauce, they quickly became delightfully marinated and soaked in a great way. The Urban Burger was brisket and ground sirloin, blended together, with cheese, pickle and Fork sauce on the side. 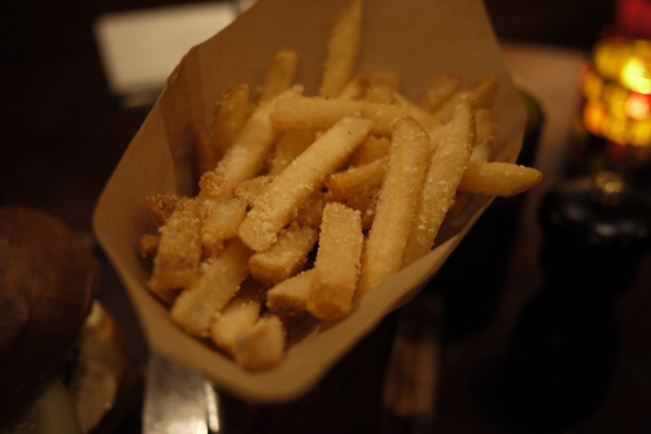 The parmesan fries from Fork were crispy, slightly tender inside, perfectly salted and dusted with airy cheese. All of that went just right together. Amazingly (and typically for me) we still opted for desert - some house-made ice cream and some sort of cream… unfortunately - I can't find notes on those final two bits - but I recall being very impressed with the ice cream. Fork shows that Boise definitely can bring it in the food department.